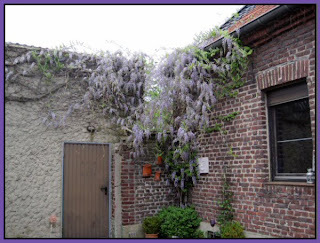 Beadles Glass: Me Loves Wisteria! Just to pop in here and show you 2010's wisteria. It is so graceful and beautiful how it gives its all with gorgeous clumps and bunches of blooms. Love it! OK...now go get busy and do something creative! I love Wisteria also. One of the most beautiful clusters of flowers! I even made a pair of earrings called "Wisteria". Going back to your bead site. You are one talented lady with glass. I loveeee your beads! Thanks so much, Joanne! 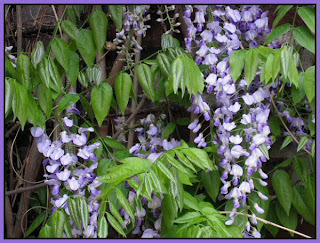 I love the way Wisteria gracefully hangs like grape clusters. Boy, does it grow fast! Will be needing to hack a bit on this one soon. Oh...had a look at your earrings - really lovely!